Usually my scrapbook pages are of events already happened. These pages look to the future as we decided to put our goals on display to keep motivated for 2011. 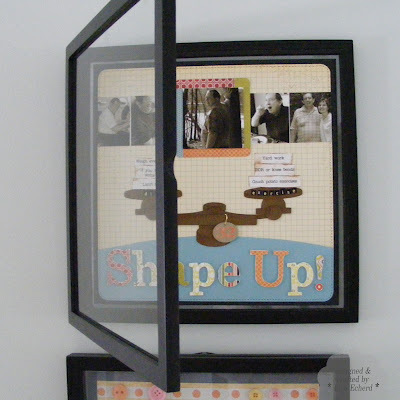 I got these wonderful frames at Target after seeing a reference to 12x12 shadowbox frames on Susan Weinroth's blog. These are hinged record album frames that actually have a display space of 12 1/2" x 12 1/2" so no losing the edges like some frames. They were $15 each and only come in black. They have glass on both sides which I don't really need but it makes it very easy to just adhere a page to the back and then change it out in future. Also my pages don't get flattened inside these. 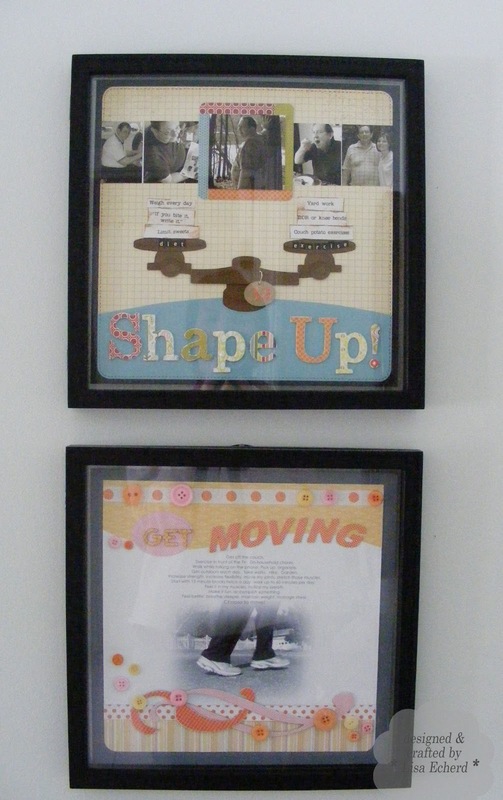 We are using two of the frames to display our resolutions for the year. They are positioned in the hallway opposite the bathroom door so you can't miss them! After I did my page, I asked Lenny if he would like one and he eagerly wanted me to create a page for him. He wasn't so excited when I made him get specific on his losing weight resolution - especially changing his diet. You see, he has made this resolution every year for many, many years. He always talks about how he will exercise but never says or does a thing about his diet. I'm a firm believer that you won't lose or keep weight off by exercise alone. Of course, as you can see by my resolution, I need to increase my exercise level. Between the two of us, we could make one real health nut! I'm really tickled with how the scales came out. They were cut on the Cricut with shapes I placed in SCAL software from just circles, squares and a couple other basic shapes. By 'welding' shapes together I got a fairly decent set of balance scales. A photo from a set being sold on Ebay helped me figure out the design. 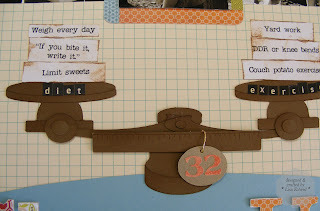 When building the balance scales, I added some Vintage photo distress ink to the edges of the top layers to add depth. 32 is a magic number, can you guess what it is??? Originally, there was just one photo of Lenny at the top but it was sort of empty up there so I kept adding stuff until I had this photo border. I bought two more of these frames and look forward to displaying other pages of fun things we have already done. Thanks for stopping by! Cardstock: Soft Suede, Baja Breeze by Stampin' Up! 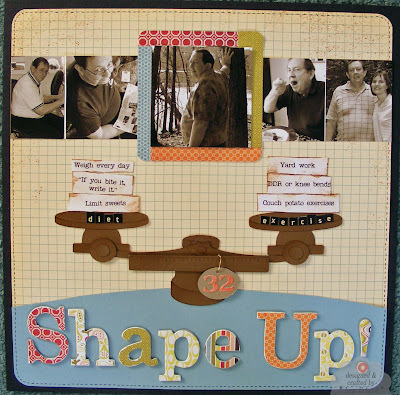 Undressed chipboard letters: Stampin' Up! Great idea ~ especially hanging the resolutions outside the bathroom (I'd need copies on the fridge and pantry door too!). love the frames. I was thinking of dressing up my walls in the craft room so these would be great to display finished pages! You did an awesome job on those scales.